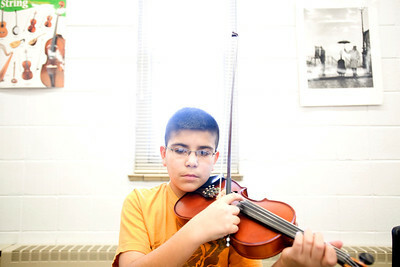 Lance Booth - lbooth@shawmedia.com Luis Garcia, 12, of Carpentersville, plays violin in sixth grade orchestra at Lakewood Elementary on Wednesday, February 8, 2012. The elementary school received a grant from the Mr. Holland Opus Music Foundation, which will help purchase instruments. 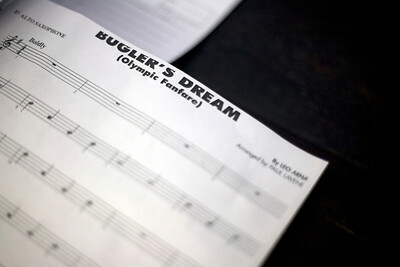 Lance Booth - lbooth@shawmedia.com A sheet of music lies on a desk at Lakewood Elementary on Wednesday, February 8, 2012. The school received a grant from the Mr. Holland Opus Music Foundation and will use the money to help band and orchestra classes. Lance Booth - lbooth@shawmedia.com Eduardo Carrillo, 11, of Carpentersville, plays violin in sixth grade orchestra at Lakewood Elementary on Wednesday, February 8, 2012. The school received a grant from the Mr. Holland Opus Music Foundation and will use the money to help band and orchestra classes. 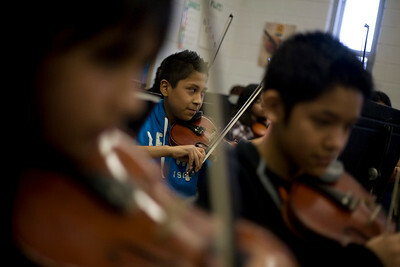 Luis Garcia, 12, of Carpentersville, plays violin in sixth grade orchestra at Lakewood Elementary on Wednesday, February 8, 2012. The elementary school received a grant from the Mr. Holland Opus Music Foundation, which will help purchase instruments.